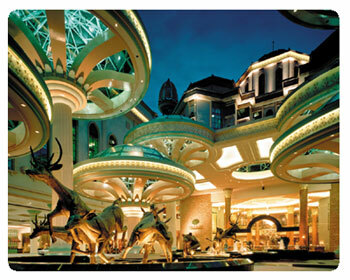 This amazing 800-acre “Resort-within-a-City” landmark delivers a fusion of Malaysian warmth and hospitality. Be it an intimate getaway, family fun or a business meeting, the Sunway Resort Hotel & Spa brings choices on every occasion. Just 25-minutes from Kuala Lumpur, this destination boasts 1,234 guestrooms with the flagship 5-star Sunway Resort Hotel & Spa, ultimate luxury at The Villas, the 4-star Pyramid Tower Hotel and a collection of serviced residences at Pyramid Suites & Studios. For meetings, incentives, conventions and exhibitions, this integrated destination offers over 50 world-class meeting space, making this one of Malaysia’s most versatile conventions and exhibitions venue. Leisure facilities include the Balinese-inspired Mandara Spa, a massive free-form landscape swimming pool, a fitness centre, the popular Sunway Lagoon Theme Park, Sunway Wildlife Interactive Zoo, an Extreme Park, and Sunway Pyramid – a mega shopping and entertainment mall with over 500 retail outlets, entertainment and leisure facilities. The Resort’s seamless integration of facilities, services and amenities allow guests direct, within minute-access, to a multitude of leisure and business. 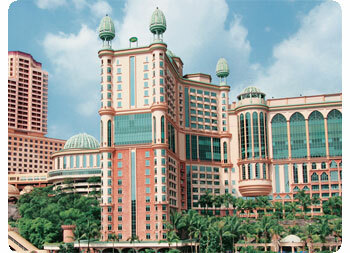 The 5-star Sunway Resort Hotel & Spa, the flagship of this award-wining resort, features The Club and Premier category of rooms and suites. The Villas, exquisitely designed and luxurious Asian-styled villas features only 17 units of private hideaway; complete with a private plunge pool, leafy balcony & terrace, rain-shower, sunken tub and butler service. The modern and vibrant 4-star Pyramid Tower Hotel offers convenient and practical superior rooms while the Pyramid Suites & Studios offer added space and services of a serviced residence. A collection of 1,234 guestrooms and suites comprising of The Club rooms, Theme rooms, Premier, Deluxe, Superior, Studios and The Villas. Extra bed at RM80.00++ (RM92 nett). Any additional charges are payable direct to the hotel. One (1) night stay for any late cancellation less than 72 hours before the arrival date or NO SHOW policy will be imposed. Pets and durian are not permitted in the hotel premise. Unless otherwise specified, all rates are subject to 10% service charge and 5% government tax. Rates are subject to changes without prior notice. Extended check-out time rate: Up to 6:00 pm at 50% off published rates. After 6:00 pm, full rate applies. Maximum of 2 adults and 2 children per room per stay. The Hotel reserves the right to adjust rates in the event of changes in government legislations concerning tax and service charge.